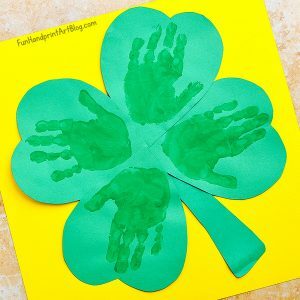 Today we are showing you how to make a rainbow handprint art keepsake for St Patrick’s Day. 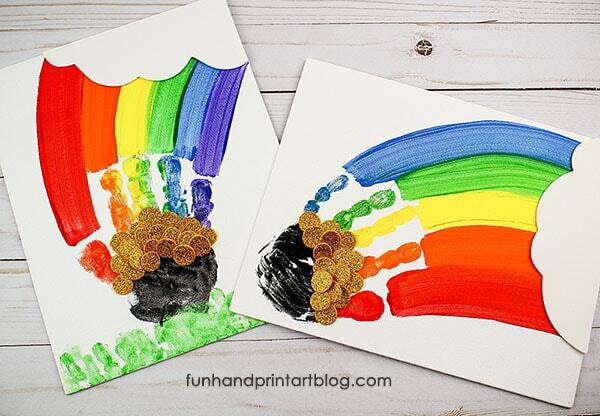 This vibrant handprint rainbow painting on canvas can be made with or without the black pot of gold palm print (see craft suggestion below). 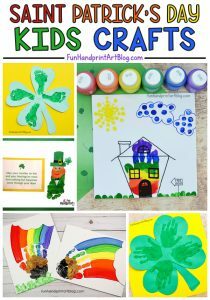 Read on to see the full St Patrick’s Day canvas art tutorial! 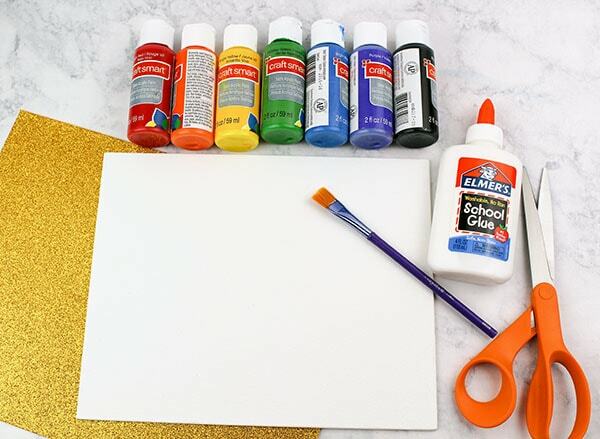 Place all the paint colors needed, including black, on a paper plate or paint palette. 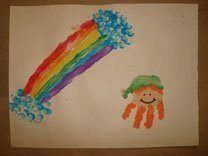 Painting Tip: When using acrylic paint with kids, keep in mind that it will stain clothes. 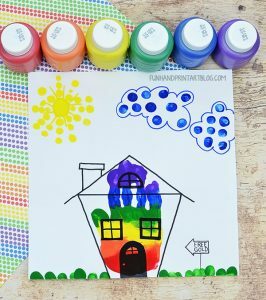 Also, if you are using bottles that aren’t brand new, the paint sometimes thickens a little making it too dry for handprints. 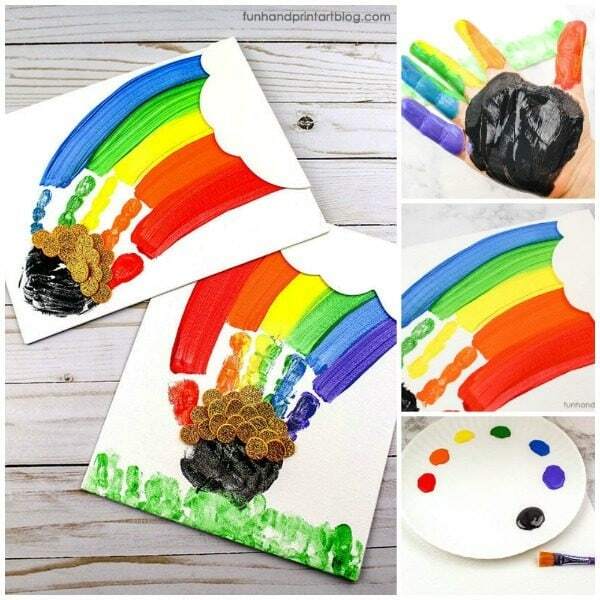 All you have to do is add a small drop of water to the child’s hand and mix it (or in the blob of paint before painting the hand). 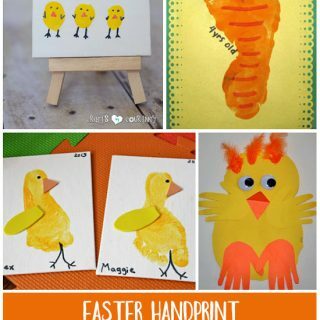 Start by painting the child’s fingers – each with a different color. 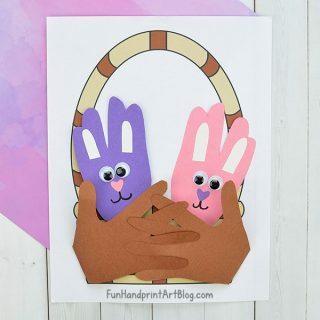 If you’d like to use all six colors, spread out three colors over two fingers. 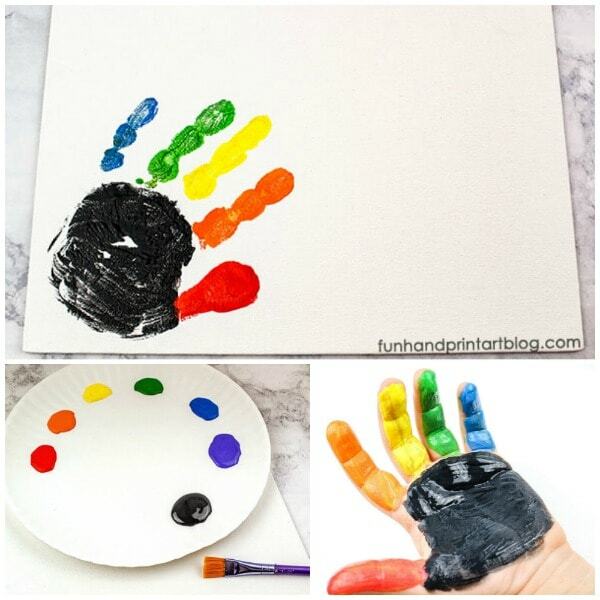 After the fingers are done, paint the child’s palm hand with black paint. Craft Suggestion: Instead of adding a black palm print, make a palm print cloud. 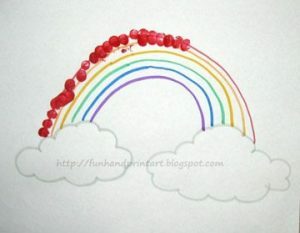 Just switch out the black paint for either blue or light gray in addition to swirls added to create the cloud look. 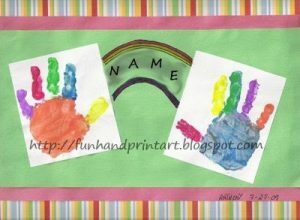 Firmly press their hand on to either the corner or the bottom-center of the canvas. Lift straight up in one quick motion. Set aside to dry. 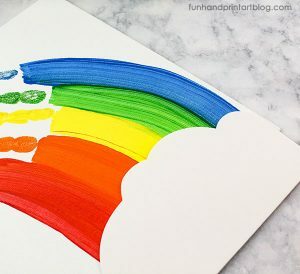 While it’s drying, the child can paint a rainbow starting at the fingertips and going in an arch to the opposite end of the canvas. 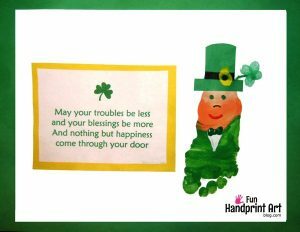 Next, cut small circles from gold glitter craft foam and then glue them onto the black palm print. 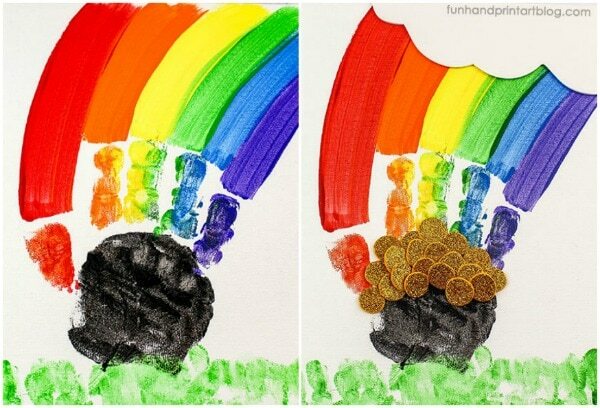 This creates the pot of gold. I love that the craft foam is glittery! 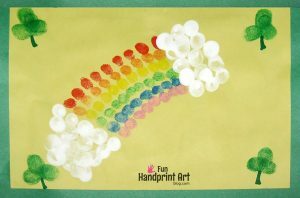 After the pot of gold is done, cut a cloud shape from the white craft foam and then glue it on the top of the end of the rainbow. 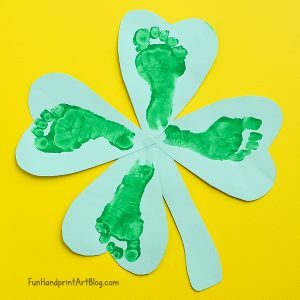 To create the grass, dip your child’s finger in green paint and then have them make prints along the bottom of the canvas. 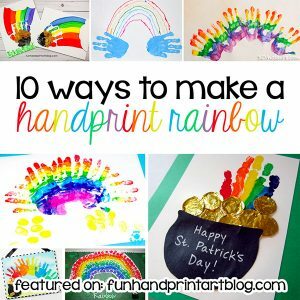 Apply more paint to the fingers as needed. 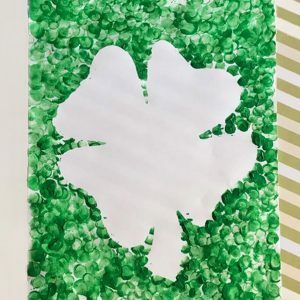 Once dry, the St Patrick’s Day canvas craft can be displayed on the wall as a symbol of luck. 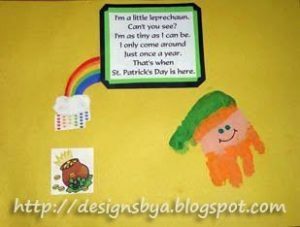 Kids are fascinated by the pot of gold at the end of the rainbow as well as trying to catch a leprechaun. 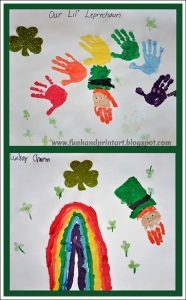 This rainbow handprint craft is a fun way to enjoy exploring your child’s interest and teach them about Irish culture plus the symbols that are often associated with St Patrick’s Day. 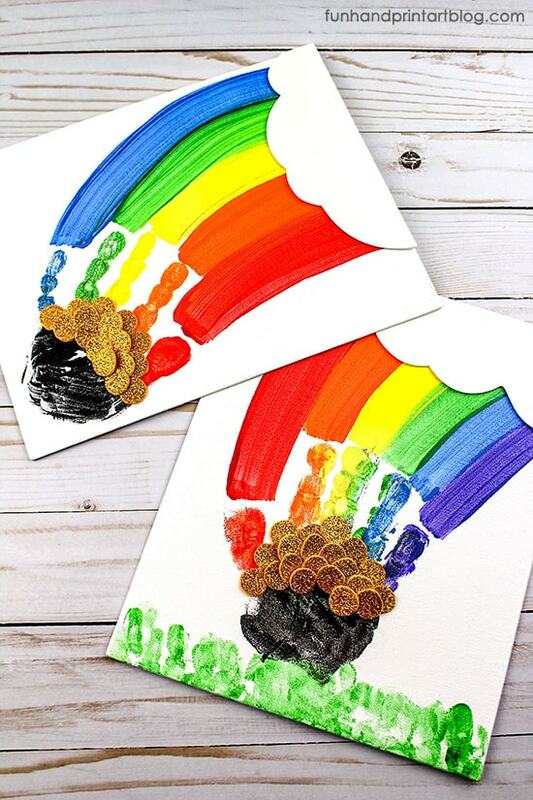 What creative rainbow painting projects have you made with the kids? 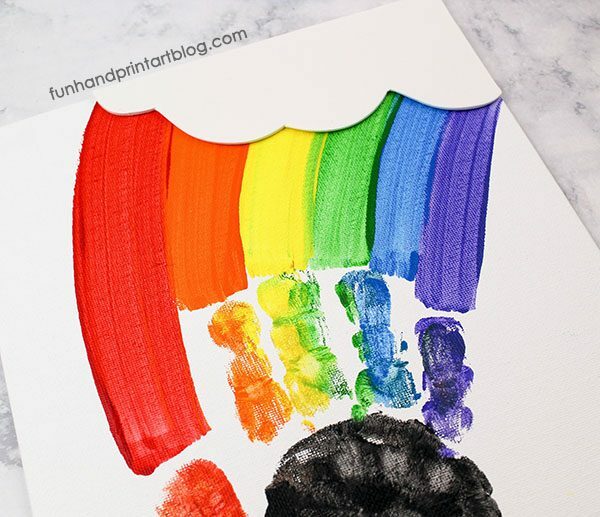 If you enjoyed this rainbow handprint art keepsake, here’s a fingerprint rainbow you could also have the kids make next.